Alternative CJS Sentencing and Corrections Policies. 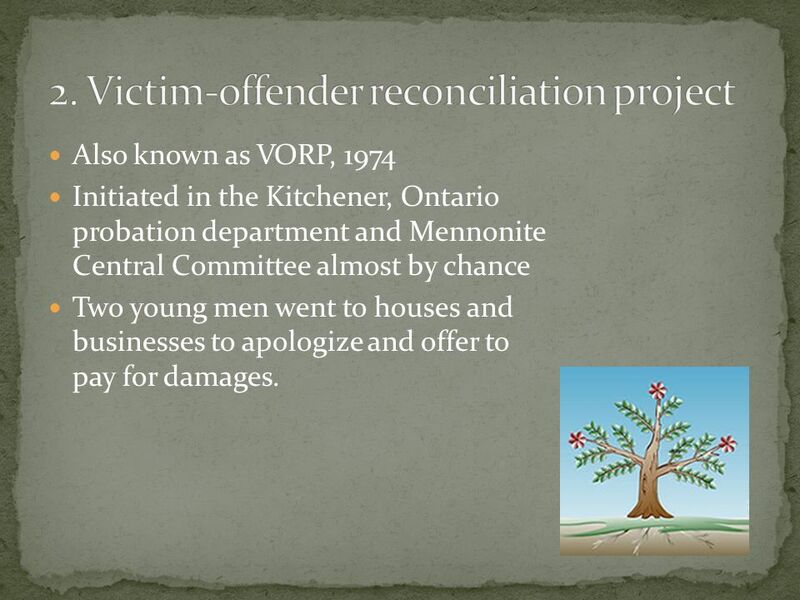 5 Also known as VORP, 1974 Initiated in the Kitchener, Ontario probation department and Mennonite Central Committee almost by chance Two young men went to houses and businesses to apologize and offer to pay for damages. 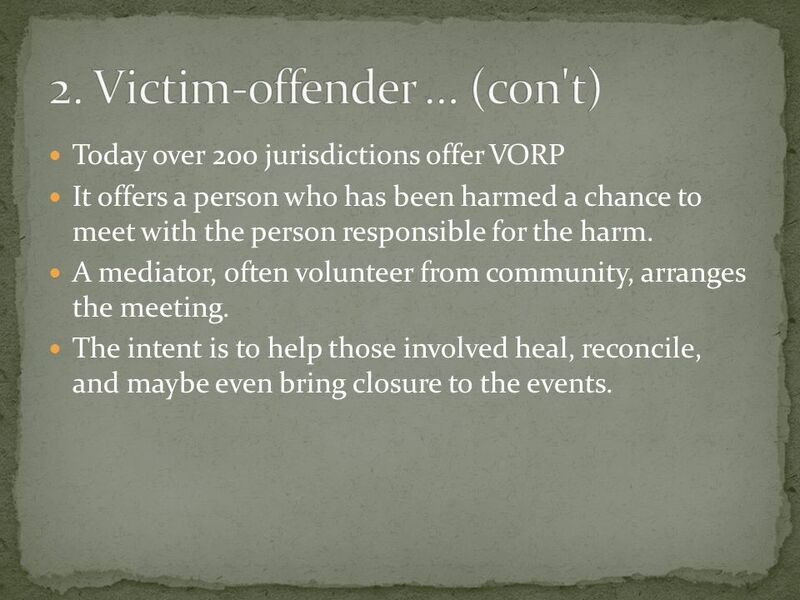 6 Today over 200 jurisdictions offer VORP It offers a person who has been harmed a chance to meet with the person responsible for the harm. A mediator, often volunteer from community, arranges the meeting. The intent is to help those involved heal, reconcile, and maybe even bring closure to the events. 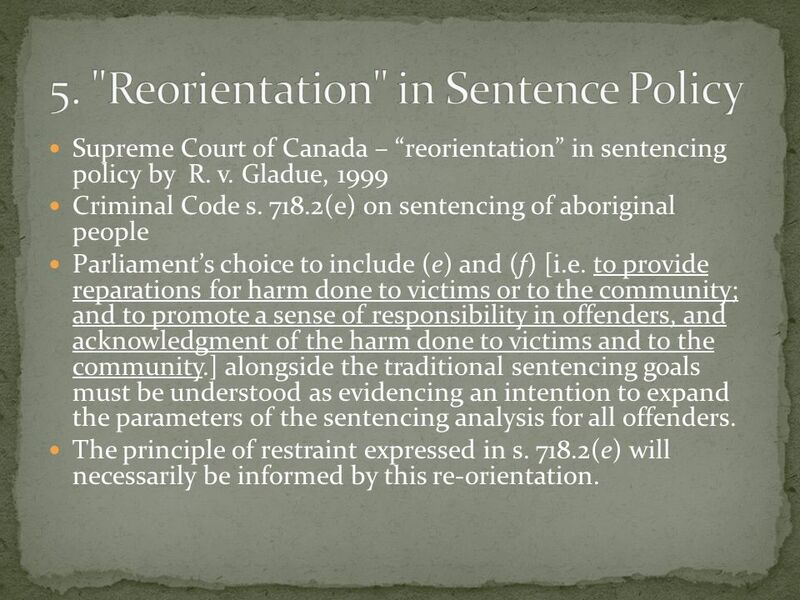 10 Supreme Court of Canada – reorientation in sentencing policy by R. v. Gladue, 1999 Criminal Code s. 718.2(e) on sentencing of aboriginal people Parliaments choice to include (e) and (f) [i.e. to provide reparations for harm done to victims or to the community; and to promote a sense of responsibility in offenders, and acknowledgment of the harm done to victims and to the community.] alongside the traditional sentencing goals must be understood as evidencing an intention to expand the parameters of the sentencing analysis for all offenders. The principle of restraint expressed in s. 718.2(e) will necessarily be informed by this re orientation. 11 Bill C-7, the Youth Criminal Justice Act (YCJA), 2002 Replaces the Young Offenders Act (YOA) as of April 1, 2003 Highlights include: Communities and families should work in partnership with others to prevent youth crime by addressing its underlying causes, responding to the needs of young persons and providing guidance and support. The youth justice system should take account of the interests of victims and ensure accountability through meaningful consequences and rehabilitation and reintegration. The youth justice system should reserve its most serious interventions for the most serious crimes and reduce the over-reliance on incarceration. 12 1. 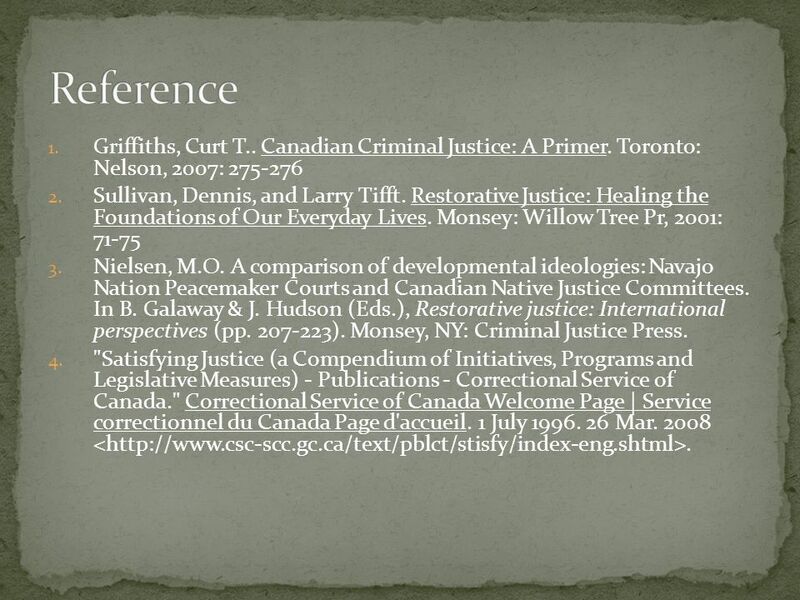 Griffiths, Curt T.. Canadian Criminal Justice: A Primer. Toronto: Nelson, 2007: 275-276 2. Sullivan, Dennis, and Larry Tifft. Restorative Justice: Healing the Foundations of Our Everyday Lives. Monsey: Willow Tree Pr, 2001: 71-75 3. Nielsen, M.O. 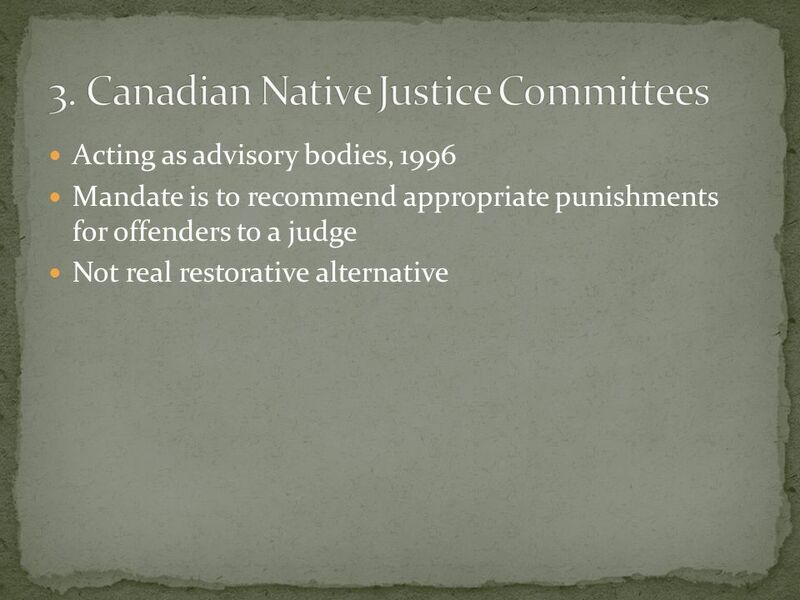 A comparison of developmental ideologies: Navajo Nation Peacemaker Courts and Canadian Native Justice Committees. In B. Galaway & J. Hudson (Eds. ), Restorative justice: International perspectives (pp. 207-223). Monsey, NY: Criminal Justice Press. 4. 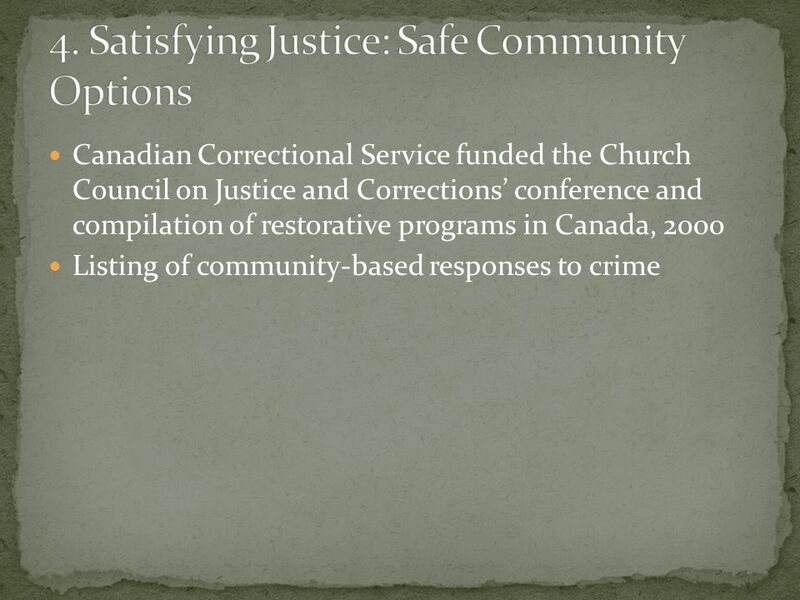 "Satisfying Justice (a Compendium of Initiatives, Programs and Legislative Measures) - Publications - Correctional Service of Canada." 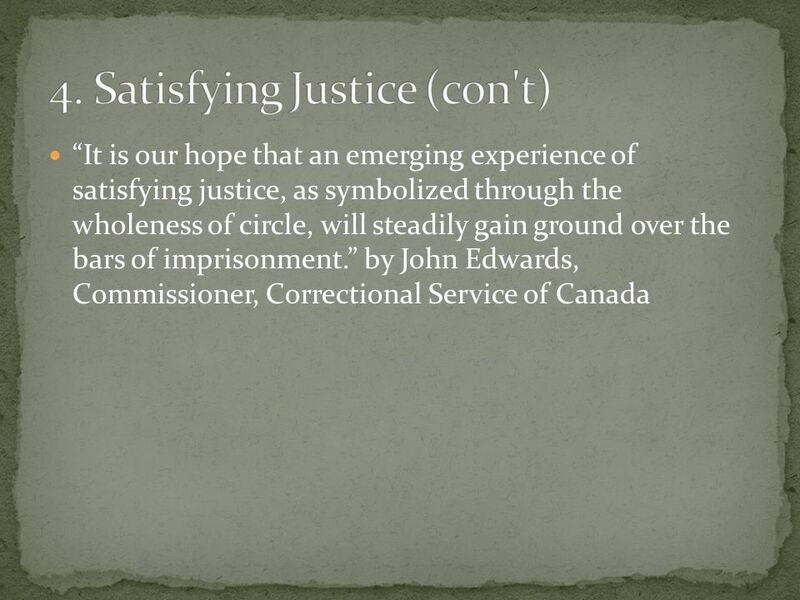 Correctional Service of Canada Welcome Page | Service correctionnel du Canada Page d'accueil. 1 July 1996. 26 Mar. 2008. 13 5. "Supreme Court of Canada - Decisions - R. v. Gladue." Supreme Court of Canada - Decisions -. 23 Apr. 1999. 26 Mar. 2008. "Bill C-3: The Youth Criminal Justice Act (LS-356E)." Parliament of Canada - Parlement du Canada. 21 Feb. 2000. 26 Mar. 2008. 6. 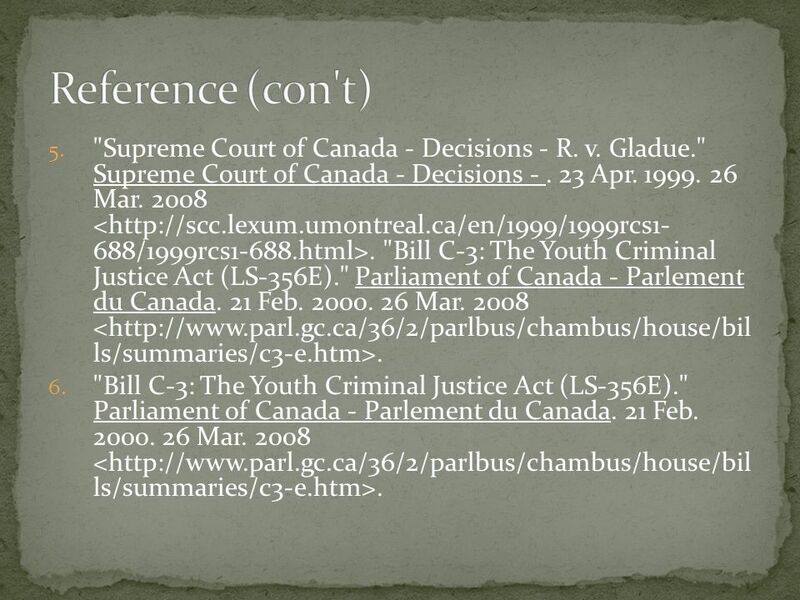 "Bill C-3: The Youth Criminal Justice Act (LS-356E)." Parliament of Canada - Parlement du Canada. 21 Feb. 2000. 26 Mar. 2008. 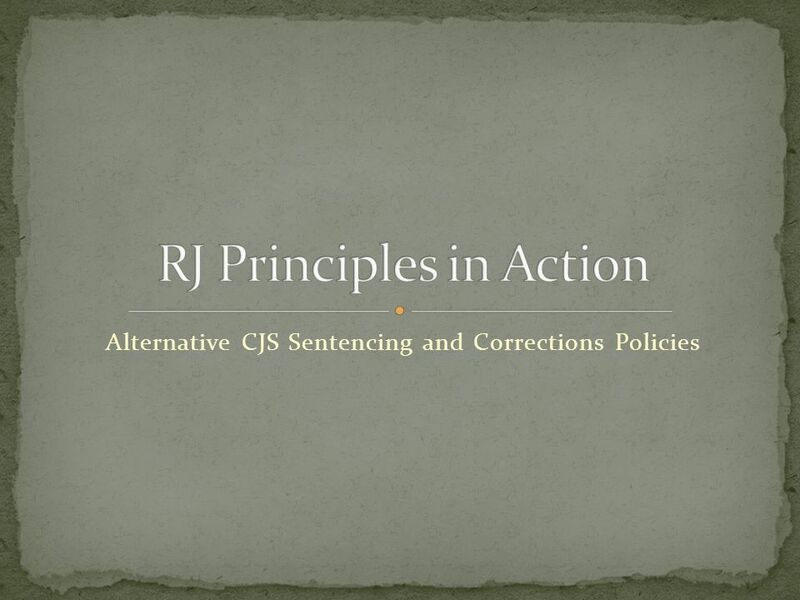 Download ppt "Alternative CJS Sentencing and Corrections Policies." Lessons Learned in Washington State: Implementing and Sustaining Evidence- Based Juvenile Justice Programs Minnesota Juvenile Justice Forum June 19, 2008. School of Criminology and Criminal Justice Restorative Justice in Australia Hennessey Hayes School of Criminology and Criminal Justice Griffith University. Priority Youth Offender Project Alice Chapman Director Youth Conference Service Youth Justice Agency. Restorative Justice in Scotland Restorative Justice in Scotland The potential for social change Richard Hendry National Coordinator: Work with Schools. 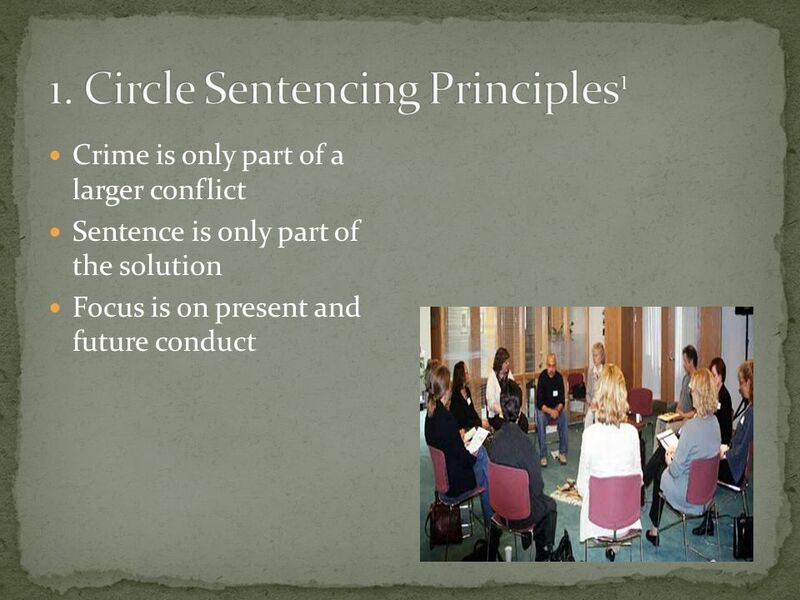 Peacemaking Circle Fundamentals Dr. Jack B. Hamlin San Diego Restorative Justice Mediation Program. Sentencing CLN4U. 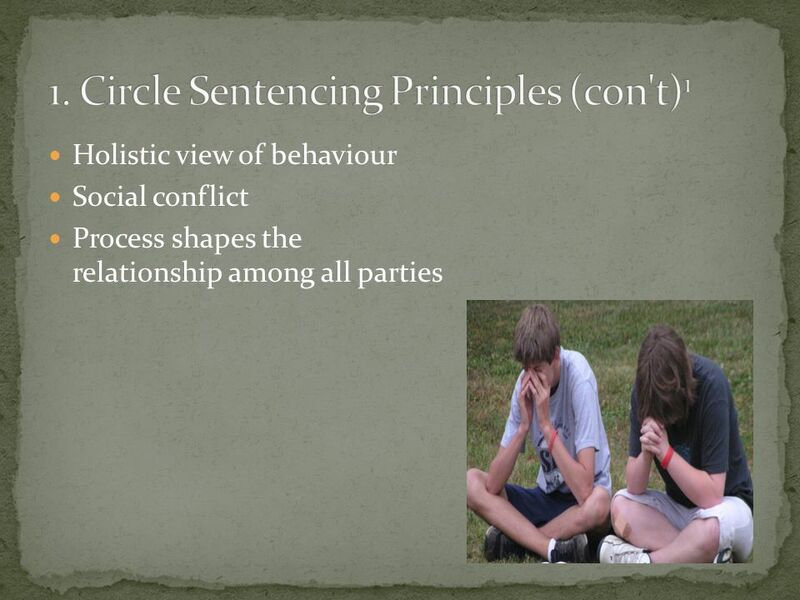 Sentencing From Section of the Criminal Code From Section of the Criminal Code The fundamental purpose of sentencing is. The Jersey Probation and After care Service Restorative Justice Initiative.  Why would the Canadian Justice system have a separate system just for youth?  What age should “youth” be considered?  Is a separate system beneficial? Quick Write Write one or two paragraphs answering all the questions below. 1.What is justice? 2.Who determines that someone has been punished for committing. Restorative Justice and Restorative Approaches: The UN and UNESCO Presented by Lucio Sia. CHAPTER TWO TWO WHAT EXTENT IS THE JUSTICE SYSTEM FAIR AND EQUITABLE FOR YOUTH? Fair and equitable – governed by rules that apply to everyone BUT ALSO. Alternative Dispute Resolution (ADR) Alternative dispute resolution is the term used for a number of dispute resolution processes that are an alternative. Alternatives to Imprisonment: An Overview of Community Sentencing in Canada Second Meeting on Authorities Responsible for Penitentiary and Prison Policies. + The Nature of Crime. + Goals By the end of this chapter you will be able to: Describe the elements that must exist for a person to be charged with and. 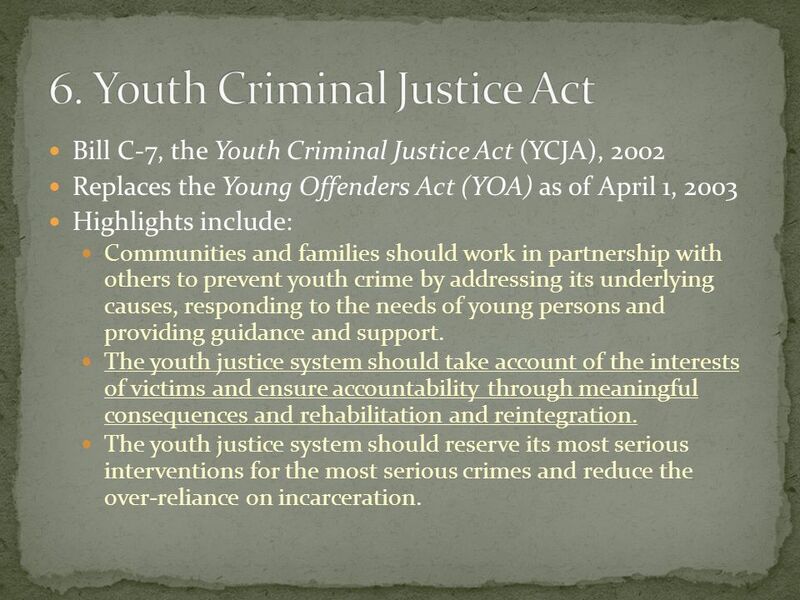 YCJA THE YOUTH CRIMINAL JUSTICE SYSTEM. JOHN HOWARD SOCIETY ROLE IN THE CRIMINAL JUSTICE SYSTEM Provides public education about the law, especially the. Downtown Community Court Canadian Criminal Justice Association CONGRESS 2009 Halifax, Nova Scotia October 30, 2009 Honourable Judge Tom Gove Provincial. 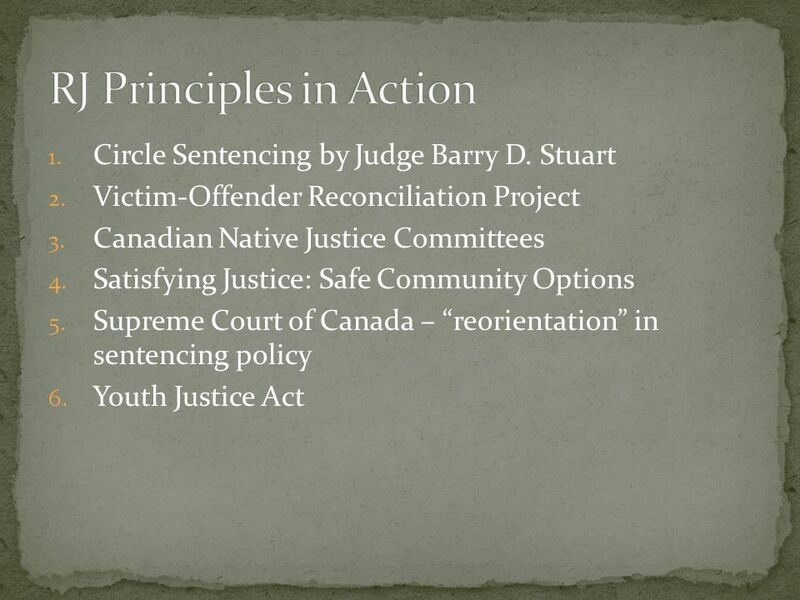 Restorative Justice & Crime Presented at Annex Business Mediation, Toronto, Ontario, June 10, 2015 Presented by Mark Yantzi, Restorative Opportunities.